Like many of you, we have been privileged to support various causes over the years (giving is a gift). The following are two NGOs that we have come to know well in Sudan and South Africa, along with a brief story of our connection to each. We welcome this opportunity to ‘put them out there’ and invite contributions, should you feel so moved. More important than giving to this or that particular cause is that we give at all, so let’s encourage one another in that. Sindiso and I were both fortunate to be raised by parents who conceived of family as something more than blood. The steady stream of “strangers” who passed through the family home and shared our table for a night or a year taught me a few good lessons, including how to give thanks for what I had. With my parents’ encouragement, my siblings and I took a year off before college to learn through serving. 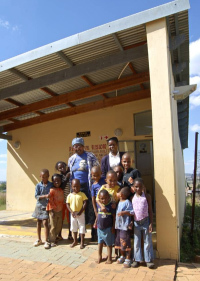 My dream of spending that year in Soweto, South Africa didn’t come to pass (turns out inner-city DC has needs of its own), but a few years later I had the chance to get involved in work for Darfur, and a few years after that to join Sindiso and her family in similar efforts in South Africa (below). 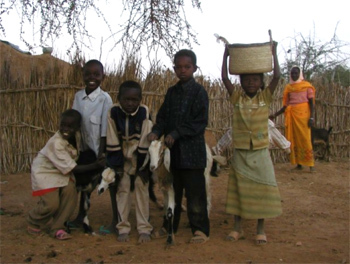 It’s been a joy to work with a small non-profit, Kids for Kids, which has been bringing relief in the form of goat and donkey loans, and a wide range of other supports, to dozens of villages in northern Darfur since 2001. Founded by the indomitable Patricia Parker MBE, whom I came to know in Oxford, the group now operates a full-fledged humanitarian campaign in conflict-affected villages in northern Darfur, serving over 200,000 women and children. While aid from the international community has been concentrated on the displaced person camps in Darfur and neighboring Chad, where conditions are relatively secure, Kids for Kids maintains a unique focus on the unprotected villages, committing nearly ninety percent of its budget to project work on the ground. The work is based on the simple premise that political engagement and ceasefire agreements, as vital as they are to ensuring that violence does not recur, are not enough to restore basic welfare and ensure long-term peace for the people of Darfur. With hundreds of villages destroyed in the violence of the last decade, wells poisoned or bombed, livestock lost to famine and drought, and limited access to basic healthcare, the prospects for Darfurians in the aftermath of conflict are still bleak. Kids for Kids’ holistic, long-term interventions, which provide basic necessities through small loans – not charity – are proving a key ingredient in the gradual strengthening and repopulation of Darfurian villages. During my time in Oxford, I worked with Patricia and friends to raise funds and awareness for Darfur, and in my final spring in 2008, I rode my bike through Scotland, Ireland, Wales and England for the cause. Thanks for joining in this vital effort. For the longest time now, my mother has practised introducing people who are unknown to me to other people, and to me, as her children. Initially, it was a bit jarring, for both my sister and me. I was fully-grown – 18 years old, to be exact – when she started MS Care and raised the funds to build the shelter in Orange Farm, which later evolved into a hospice for orphans, disabled and abused people, and people living with HIV; MS Care also supports numerous other projects through a network of people (more of her children) throughout South Africa. Nonetheless, I found that it took some adjusting to the fact that I was no longer one of my mother’s two children, and more importantly her only last born. My mother was now the mother of many. At the time, in the mid to late 90s, AIDS was still very stigmatised in South Africa yet my mother provoked my sister and I to accept these of God’s and her children as our siblings. Formally, she educated people on HIV/AIDS’s medical reality and socio-economic implications; she trained people to care for themselves and others who are (as she often describes) ‘infected and affected by HIV/AIDS’; and she welcomed with God’s love those who found themselves destitute with no one to care for them (either because their families were too poor to care for them themselves, or because their communities had ostracised them). She has been at this for over 12 years now. When MS Care has too little funding to make ends meet so as to give the people for whom she’s taken responsibility due care, she draws out of her own ever-decreasing resources to keep the project alive, and thereby keep her non-blood brothers, sisters and children alive, literally. When she’s disappointed by staff resignations and shortages (perhaps because, as she also understands, volunteering for little or no pay when you are already poor is hard for even those who sincerely wish to help shoulder the burden of care for others in greater suffering than themselves) or when burglaries seem to deplete the already limited resources and threaten the patients’ safety, she mobilises and does what she must to keep things going. And, when she finds that witnessing people’s often severe suffering – and, sometimes even, a series of losses of the lives of people who might even have noone to bury them – all becomes too overwhelming, she weeps mournfully, prays for the strength to continue and (evidently being always given that strength) she carries on serving. I could not give enough of my time, gifts, skills or money to support this incredibly worthy venture championed by this most wonderful mother who (having also given so much to me in my growing years) I gladly share with the world.